The in-house recruitment space has undergone a massive scale-up in the past decade. While talent search used to be a mainly outsourced task, more and more recruitment professionals have made their move into in-house positions, bringing down hiring costs and improving business performance. 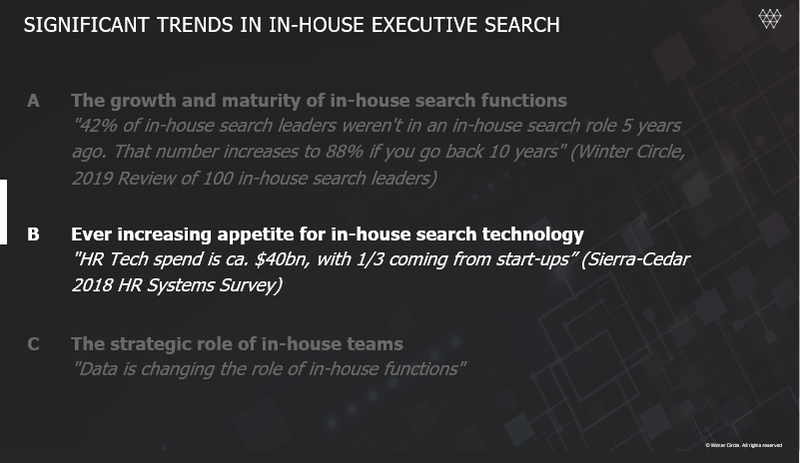 “There is definitely a shift in trend for professionals in the search market,” says Adam White, COO and Co-founder of Winter Circle, referencing a recent survey his team ran of 100 executive search leaders. As much as 88% of respondents said they were not even in an in-house role 10 years ago, with that figure dropping to 42% 5 years ago. 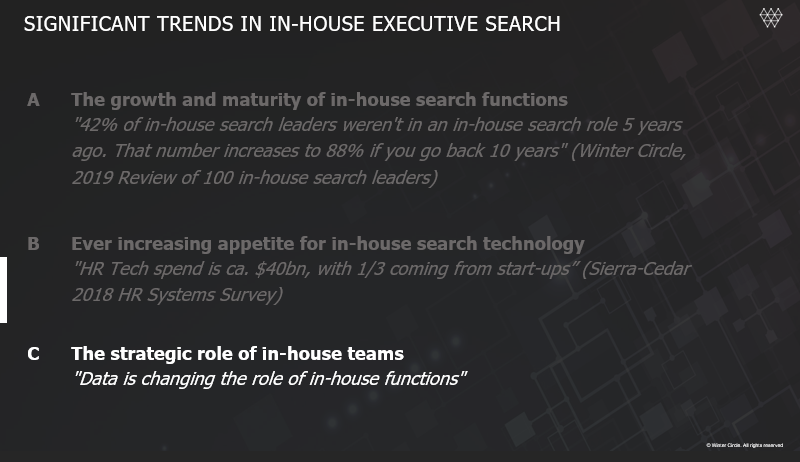 But executive search functions still have a long way to come to be as innovative as lower-level functions. “We live in a world where we have technology at our fingertips, but we’re not yet seeing that resonate in the executive search space. The HR world is spending billions on technology, but a majority of that spend is directed towards graduate and mid-level roles,” Adam says. Gamification, online assessments, predictive analytics, these are all tools that are not only making the recruitment process more efficient, but are also providing a better candidate experience. However, it’s the candidate identification stage that lacks the necessary innovation to make executive search functions more technologically advanced. Adam believes that although senior candidates may not have grown up with technology, they don’t want to be perceived as technophobic and many survey respondents even claimed they were surprised tech disruption hasn’t yet hit the search process. While LinkedIn and traditional referrals may still be the main sourcing channels for executive talent, they are no longer the most reliable and engaging tools on the market. In our next chapter we will explore some of the more innovative solutions to executive talent search. When it comes to implementing technological change, many recruiters experience difficulties gaining business buy-in. Even the majority of our breakfast event attendees agreed that investment was the most significant factor limiting the growth of their in-house search. A modern ATS and CRM system will enable them to track the candidate journey and measure engagement pre and post hire, and report it back to the business in order to drive decisions. Adam pointed out the while recruitment technology does exist, it’s not getting pushed through enough at the executive end. The role of an executive search leader is to bring in talent that will ultimately have a huge impact on the bottom line of the business. It’s a strategic business partnership role that must be acknowledged and respected by leadership in order to invest in its capabilities. If we are very vocal and use data-backed arguments to push our agenda through, technology will follow, Adam concludes. "Harnessing the Power of Technology in Executive Search"